Using the play pieces that I had from my Spraypaque session, I die cut some flowers (Tim Holts Tattered Florals) and some circles. The message is from the Punchable Labels on a 1" circle. 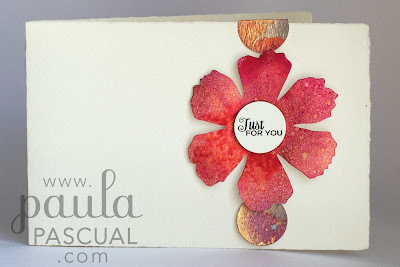 What a gorgeous card Paula - so simple yet beautiful colours. Wow - just amazing. Never heard of these sprays before, but now I want to know more. Thank you for showing us all. Absolutely stunning. I've not heard of these paints either and I will be looking out for them now.